I love Barbados. It is one of the most enjoyable of the eastern Caribbean islands. It is quite different from the majority of the islands of the Lesser Antilles, that long arc of small islands that stretches southeast from Puerto Rico to Trinidad. The Spanish and Portuguese claimed Barbados during the 16th and 17th centuries, but never made any serious attempt to settle. The British took possession in 1624 and ruled without interruption until independence in 1966. They imported slaves to work their plantations, thus giving the island its majority population today. But the imprint of British tradition is strong. Bridgetown is the hub of island commerce and culture. It is one of the larger cities of the Lesser Antilles, and its architectural flavor reflects its colonial heritage. 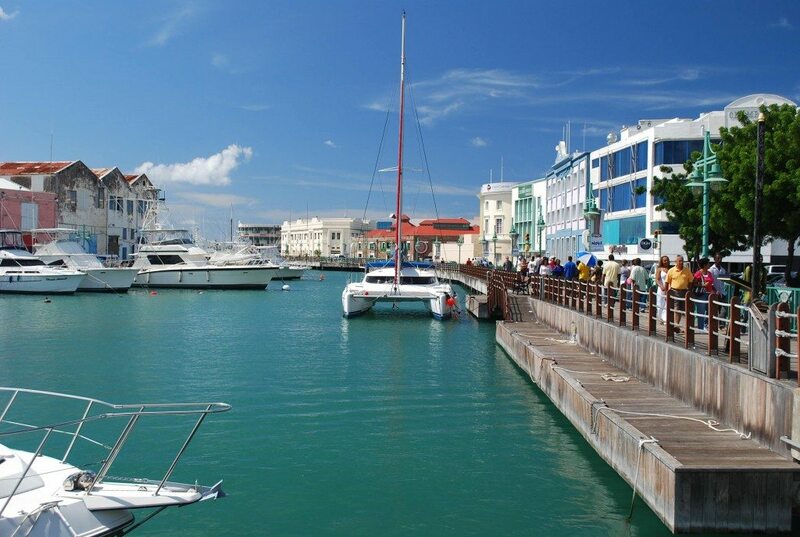 Bridgetown is also well known for its fine shopping that includes British china, woolens, fine quality Bajan rum. molasses and vanilla to name a few products. The west side of the island is protected by the bulk of the landmass and its calm turquoise waters are where most visitors and locals enjoy the mix of sun and sand. Holetown is home to elegant hotel properties such as Sandy Lane and the Four Seasons. The east side of the island is the windward shore with wild surf and strikingly beautiful coastline, but somewhat risky for swimming. The town of Bathsheba is a quiet community with small guesthouses and outstanding restaurants such as Atlantis and the Roundhouse. Driving on the island is a challenge as traffic moves on the left side of the road, there are few traffic lights, numerous roundabouts and very few directional signs. I have an excellent sense of direction, but always have difficulty finding my way around Barbados. Stop and ask for directions and you might hear something like this, “Well man, take this road until you see some sheep on the right, but then you turn left. Next look for the red telephone booth and then just after that you turn right…..” I found the red telephone booth and turned right and after that was lost again. But that’s the fun of driving in Barbados. This is a carefree island in which people are friendly, crime is minimal and visitors are always welcome since they know we bring in hard currency that is the mainstay of the economy. But there is an atmosphere of pride and accomplishment, as the Bajan people have worked hard to make their country a safe and healthy place to live or visit. So if your cruise begins or ends in Barbados, stay a few days, relax and take a drive around the island to experience its charm. You will be happy you did.